CONSIDERING THAT WE EAT FIRST WITH OUR EYES, how our food is presented on the plate- from the color, to the geometry, to the textures, becomes of great significance. In the “Edible Art” feature in our new issue, Chef Greg Arnold treats the plate as a canvas on which he creates visually arresting compositions using imaginative vegan ingredients. For Arnold, who will open Santa Barbara, CA’s first farm-to-table modern vegan restaurant MESAVERDE in early spring 2014, “cooking has been another extension of the same creative impulses I’ve had my entire life. It’s a different set of senses that get stimulated, but it’s the same intention,” he says. A painter since the age of four, he spent years touring and making music as a guitar player in Los Angeles. “The Art of Plating” video he made for us encapsulates his creative spirit- he not only created the dishes, but filmed, edited, and scored the video itself. See the six page “Edible Art” feature by getting our new issue, available in print or digital. And follow Greg Arnold on instagram or his site. THERE IS NO EXACT RECIPE FOR SUCCESS. But Jason Wrobel, who graces the cover of our new issue along with Whitney Lauritsen, seems to have a pretty reliable one for a life well lived. “Keep trusting in your dreams and your unique vision for your life,” the star of the world’s first primetime cooking series How to Live to 100 told us when we spoke to him recently. “So many people told me for years that it “couldn’t be done” or that they “already tried and were told no” – but honestly, I didn’t listen.” It is lucky for us, and the rest of the world, that he didn’t. We will get to relish his trademark blend of virtuoso cooking skills, hilarity, and encyclopedic nutritional knowledge every Friday at 6pm PST/9pm EST on Cooking Channel– starting with tonight’s premiere episode, “Goin’ Back to Cauli.” And to whet our appetite, Jason shares his recipe for Vegan Caesar Salad, and more food for thought in our exclusive chat, immediately following the recipe. To make the salad dressing, add all ingredients to a blender and process on high speed for 20-30 seconds until very smooth and creamy. If need be, add a slight amount of additional lemon juice or water to thin to your desired consistency. Set aside. Wash the heads of romaine lettuce and dry with a kitchen towel (do not break apart the individual leaves – leave the heads fully composed). Cut off the hard base of the stems and make a small, lengthwise base cut on the underside of the lettuce heads so that they can lay flat on a plate without rolling or tipping over. 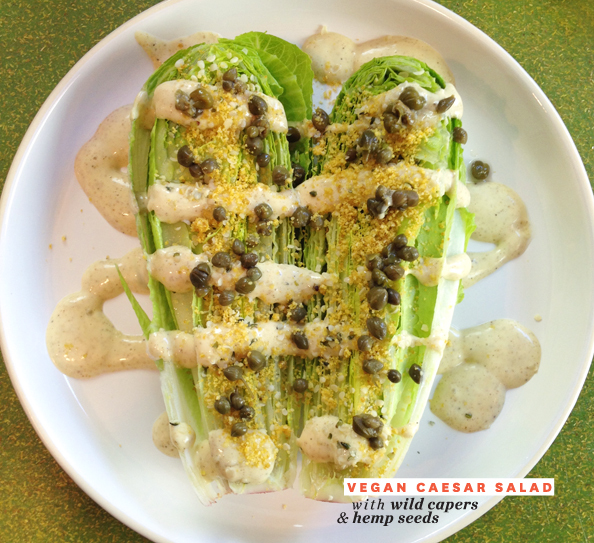 Liberally drizzle the dressing over the top of each romaine head and top with capers, hemp seeds, vegan parmesan cheese, dulse flakes and ground black pepper. Serve immediately. Cook’s Note: If you cannot find vegan parmesan in your area, you can order online from a brand like Parmela, or substitute a sprinkle of nutritional yeast. For 4 broadcast episodes and 6 webisodes, it’s a three week shoot. The creative process is very interesting and challenging. Since the format of the series features a “hero” ingredient in each episode, my mission is to construct delicious and easy recipes that showcase that specific ingredient. Recipe development can be intense, really fun and, at times, frustrating. Don’t even get me started on how much I filled the compost bin with “Cauliflower Rice Pudding” or “Cauliflower Flan”. Needless to say, I stuck with only savory recipes for episode one, “Goin’ back to Cauli”. I shall one day unlock the power of cauliflower for desserts! It can’t be easy landing a primetime TV show. How on earth did you do it? Great quote. Let’s pretend I’m Paula from Alabama and I don’t know a lick about vegan cuisine. How would you persuade me to watch your show? I’d tell Paula she doesn’t have to give up any of the taste, texture, flavor or amazing mouth feel of the food she’s used to. You want spicy, crispy, meaty Buffalo Wings, mama? We’ve got buckets-full. You want al dente Pasta Primavera? Italian grandmas have me on speed dial, yo. Oh, and creamy Coconut Cream Pie? It’s like a Caribbean vacation for your mouth. The intention of my recipes on the show is to recreate familiar, comfort-food dishes that people know and love with healthy ingredients and superfoods. That way, people are still enjoying the heck out of their food while leaving out all the excess fat, cholesterol, sugar and sodium. Everyone wins, and Paula’s family stays happy, healthy and satisfied. My big piece of advice is to start with doing your research. I would suggest downloading a ton of amazing vegan recipes online for free or buying a few well-reviewed cookbooks. Then get educated on the nutritional requirements of a vegan lifestyle – you can get all the protein, amino acids, magnesium, iron, calcium, vitamins B12, D3, K2, etc. your body needs from plant-based foods exclusively. But you need to know WHICH foods to eat and WHEN to eat them to have balanced, optimal nutrition. Lastly, buy three pieces of essential equipment to make your life in the kitchen easier: a high-speed blender, a really good chef’s knife and a quality cutting board. As far as delicacies, my favorite food category right now is non-dairy cheese. There are INSANELY delicious brands of cheese on the market from brands like Daiya, Treeline, Kite Hill, Punk Rawk Labs… honestly the list is freakin’ huge now! We are reaching a new level of amazingness- from product innovation to consumer demand – for non-dairy and vegan products. It’s an exciting time to live this lifestyle and hearing things like “I really wish they made a vegan version of… (fill in the blank)” doesn’t exist anymore. A vegan cheese-themed viewing party of How to Live to 100 would be just the thing. Speaking of your show, any funny or triumphant anecdotes you can share? Two moments come to mind. The first was doing the “Goin’ Back to Cauli” episode where I was making Cauliflower Lentil Tacos and Guacamole in the kitchen. After we wrap our kitchen segments, the crew usually eats the finished recipes from the set. So, all these really masculine dudes from Atlanta (who are the brilliant lighting crew) are chowing down on the tacos and just beside themselves with astonishment over the taste. In fact, a few of the guys asked me for the recipe and their wives made it for them AGAIN for dinner that same night! That’s what I call a win. The second moment was making the Strawberry Tomato Crepes for the “Attack of the Scrumptious Tomato” episode. Crepes are notoriously finicky for sticking to the crepe pan (especially the first one or two crepes out of the pan). So, the batter was looking good and I was feeling pretty confident, so I decided to improvise and go for a big flip – having NEVER flipped a crepe in mid-air before. I’ll let you watch the episode and see how that one turned out. Tune in tonight, January 3rd at 6pm PST/9pm EST for the season premiere of How to Live to 100. Use the hashtag #howtoliveto100 to talk about the show on your favorite social media sites. Pick up a copy of our brand new Issue Three to read our in-depth feature on Jason Wrobel and Whitney Lauritsen on page 60.